Size (inches): 2.56" X 11.81" X 10.04"
Take your puzzling to a new dimension and bring a cozy cottage to life. 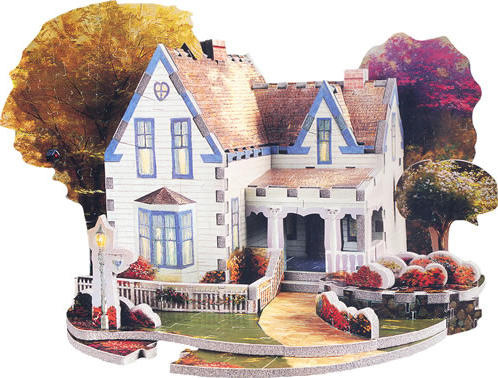 267 foam-backed pieces let you build a realistic model of the sweet estate featured in renowned artist Thomas Kinkade's "Home Is Where the Heart Is." This work is one of the most popular from America's most collected living artist. Kinkade is a painter-communicator whose tranquil, light-infused paintings bring hope and joy to millions each year. On a difficulty scale of 1 to 4, the manufacturer rates this one a 1 (easy), so it's great for those trying this kind of 3D puzzle for the first time!